Who feels like waking up extra early on a cold morning to schlep around the kitchen and prepare a full breakfast? Not us – we’d rather put in the work the night before. 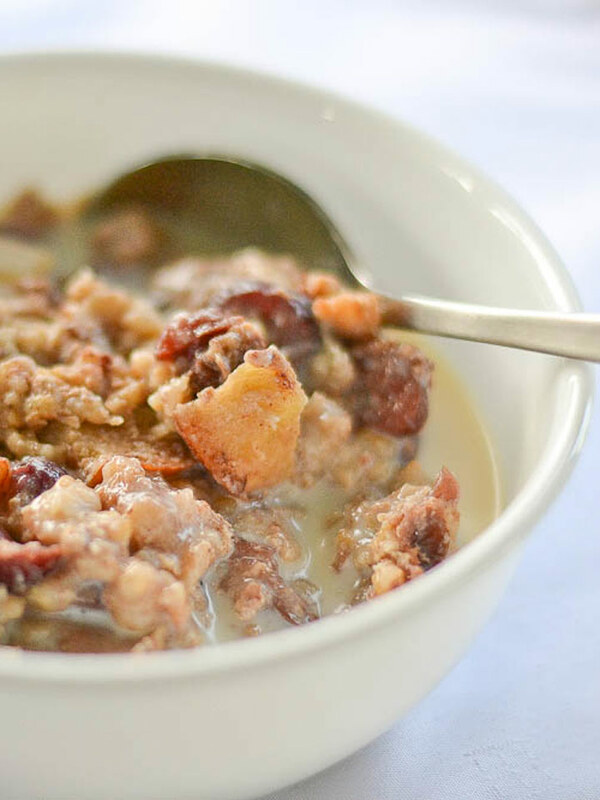 If you have a slow cooker handy then Liza has got the perfect recipe for you to try out (and if not, you should get one), featuring steel-cut oats: a heartier, nuttier, and arguably even healthier alternative to more commonly used rolled oats. Liza livens up her grain with chopped apples, dried cranberries, and just the right amount of butter and brown sugar. All you have to do is mix your ingredients together in the slow cooker and let the magic happen. The oats will thicken and take on the array of sweet flavors overnight, and by the time morning comes you’ll be all set to start your day off healthy and right with an “instant” bowl of delicious, warm oatmeal (and the next few days, for that matter). Liza is the writer behind Salu Salo, a blog whose name comes from a Tagalog word for gathering and eating together. Liza’s cooking is mainly influenced by her childhood growing up in the Philippines and her part-Chinese heritage, working with the ingredients that are available to her where she now resides in Vancouver, Canada. There, she has been able to adapt many authentic Filipino recipes through her own experimentation. Liza shows in her cooking that meals can be quick, simple and delicious all at the same time, using accessible ingredients. With a beautiful presentation and a friendly narrative, Liza is not shy about sharing her tips, techniques, or trials and errors – every delicious dish comes with its own story. Head over to Salu Salo and say hello to Liza on Twitter, Facebook and Pinterest. Steel cut oatmeal is great for an on-the-go breakfast every day of the week. Here’s how to make a big batch ahead of time and store it away for breakfast.